Reupholstering our bench seat cushions = no joke. But after five long weekends, we finally did it. Okay, the title is a little misleading and sarcastic and only partially true. BUT, I did successfully reupholster Elsie’s cushions with little to no sewing experience. Looking back, I probably should have started a little smaller. But seat cushions are like one big throw pillow, right? It started on a Saturday. My mom and I went fabric shopping at JoAnn’s. I hadn’t spent much time at this store, but I gotta tell you: it was nice. They had a lot of fabrics to choose from and from new designers, too, like Nate Berkus. Sure, they had felt and fleece and grandma patterns. It’s a fabric store. But still, I was impressed. After lots of looking we landed on a grayish brown faux leather material for the seat cushions. We considered doing it all in this material, but being me, I wanted something with a little more flair. Carson and I ended up picking the fabric for the back cushions a few days later, a pattern that kind of looks like jean material. Next came the hard stuff. Measuring the right amount of fabric. Thankfully I had some pretty skilled technicians over at Joann’s. I told them about the project and brought in one of the old cushions. After about 15 minutes of using the calculator and consulting with at least one other store representative, we landed on just the right amount of yardage: four yards of fabric per cushion (we had four) should do the top, bottom, sides, piping and zipper. After we had the fabric, I was ready to knock these cushions out in a weekend. But hard stuff round II happened. The process of cutting and measuring the fabric pieces took one full day. Much longer than I anticipated! Also: I hate cutting. Cutting the fabric. It took me an entire day to cut just the right size of sides, tops, bottoms, etc. for all four cushions. First I de-assembled one of the old cushion covers. This was smart because I used it as a pattern for cutting my new fabric. While four yards was indeed enough fabric, it did not leave a lot of wiggle room. I had to use the calculator again and map out where to cut which pieces. Then I had to use the cutting mat and rotary cutter to slice out all four cushions worth of strips. On Sunday, I thought: let’s sew this sucker together! This is where I’ll introduce my accomplice, Carson’s mom, Mary. She’d sewn a lot of stuff over the years, including a rain jacket (what?!) and helped me out tremendously. But mostly with the actual sewing. I had never done a zipper before and she suggested we start there. We figured out how the zipper foot worked on her new sewing machine and I put in the first half of the zipper no problem-o. With the other side we found issue no. 3. Getting the zippers in the blue fabric was a cinch compared to the vinyl. Bought these bad boys at Joann's. I'm smiling here. But only to keep from crying. Faux leather vinyl bunches up. Had we been smart, we would have started with the easier non-vinyl fabric. But this is me we’re talking about. We couldn’t get the other half of the zipper on straight because we were getting a lot of bunching. So, we ripped it out and tried again. Then again. And again. It was now the end of the weekend and I had yet to put in a full zipper. Mary said she’d look into it until we came back the following weekend. She solved it with tape and tissue paper. The bunching was happening because the vinyl was sticking to the machine. After we used the tape and/or tissue paper trick, we were able to move on. Note: Mary installed the first zipper (thank you!). The next weekend I came back ready to knock it out for real. I sat down at the machine with Mary and put in the second zipper no problem. Next up, problem no. 4. Piping is not easy. We applied the piping to the side pieces. Turns out that you’ve got to sew pretty darn precisely to make it look good. And the vinyl was sticking again, it was slow going. Also, we were sewing with not a lot of wiggle room (I cut it without any excess!). It took an entire day to do about half the cushions. And there goes weekend no. 2. 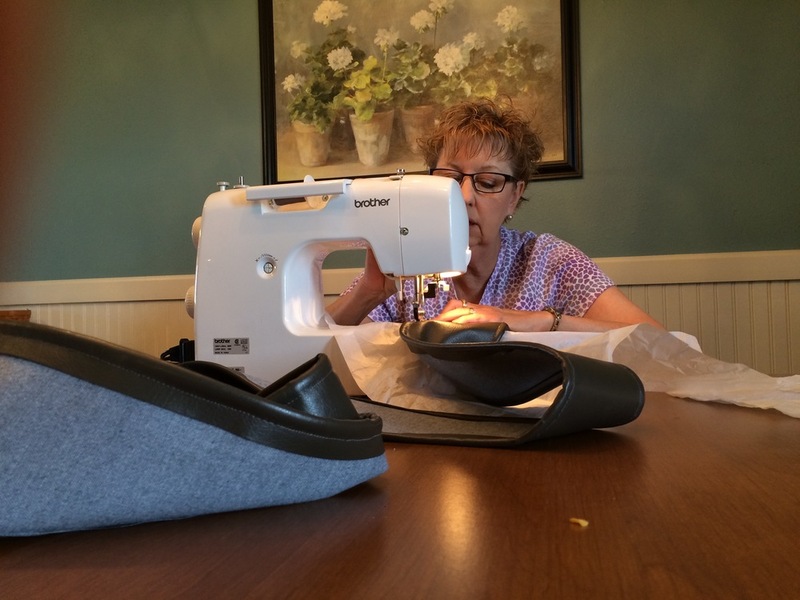 Mary sews a pretty expert level piping here. The piping was a work in progress for quite a long time. It's a good thing you can't see my full face here. I'm probably swearing. The third weekend I came back and did not work on the cushions. In one of my (many) sewing mistakes the previous weekend, I took piping out of what I thought was a incorrectly sewn piece. Then realized that I had actually de-assembled one whole side panel that was perfectly fine. UGH. This brings us to weekend no. 4. I wasn’t happy, but I was determined. The piping was all set. Zippers in. All we had to do now was affix the sides to the tops and bottoms. And this brings us to problem no. 5. Blind sewing. First, it took us a long time to figure out how to attach these pieces together. We spent a lot of time thinking, holding, trying, and pinning. My tip for this part is PIN, PIN AWAY. We had to do a lot of pinning to make sure that everything lined up. Then came the part I really struggled with: blind sewing. Because of how these ultimately assembled, you had to sew by feel. Which means you had to hold everything taut under the machine and sew where you couldn’t see what was happening on the other side. I was terrible at blind sewing. So, Mary did almost all of it. She sewed. I pinned. It was kind of a match made in heaven. We had 1.5 weekend days of blind sewing. Now it was getting to the end of the third weekend. We’d sewed all the pieces together. All we had to do now was put the new cushion covers on the old foam. Problem no. 6. Stuff sticks to foam. Getting these covers on was tight! And hard. Mary had learned a trick from a friend in town: use a plastic dry cleaning bag to cover the foam so that it slides on easy. And…it worked! Amazing. Costello was pretty bored during the whole thing. These cushions were looking pretty darn good. Not perfect, but honestly you’d have thought a quasi-professional did these. The next weekend I came back and we did it all again on the blue fabric. The vinyl fabric was the toughest because it was so unforgiving. I’m not sure I’d choose that fabric again. Also, because that vinyl was so hard, Mary ended up going back and fixing a lot during her work week. MARY = SEWING GODDESS. The following weekend I sewed together the pillow covers (with zipper!) which seemed so easy compared to what we just did that I’m not even going to explain it. So, after five weekends of sewing we did it! What do you think? Any tips for the next go around? Pretty professional-grade stuff, right? The patterned pillows are the Nate Berkus fabric I was telling you about. Me enjoying the hard-earned fruits of my labor. WE DID IT.